Crafty or Crazy: Nephew number 5! I'm a bad Aunt....nothing in this picture was hand done by me! 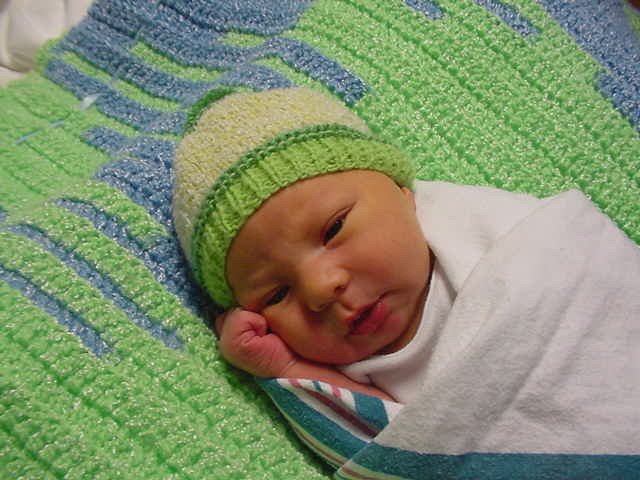 But soon I will have that blanket done...He was born on the 22nd just as Rich and I were on the plane to come over. He is healthy and so is Mom, though they both had a rough journey. I get to spend a few days with them in the new year so I'm looking forward to that. Rich and I were lucky. The fog that was cancelling a lot of the flights out of London, didn't stop us. We flew with Aer Lingus (Irish company) and their flights were taking off, though they were an hour late. We enjoyed the fact that you can go through immigration in Ireland, and don't have the hassle when you get to the States. Chicago was warmer then London....go figure! We are holding up pretty well, though I'm still feeling the effects of a head cold I had before I came over. One December I would like to go without a cold. I'm busily trying to make this for my niece...last minute present. I also plan on working my way through The Creative License book by Danny Gregory, and using my new moleskine to do it. I'm using real artists pens, which are making a difference. I don't want to get to where I am a master drawer. I just want to be able to interpret what I see in my head or eyes on to the page for embroidery. I did order the book The Art of Knitting and it is wonderful. I haven't had the time to really look at it, but since I had it sent to my Mom's I will hopefully have some time soon to get to it! Off I go to spend time with the family! Congratulations..He looks as if he has a "great ...look where I ended up" pose going on!! My gosh, what a cutie he is! Congratulations! He is gorgeous. Glad you didn't have trouble with the fog and have got to be with your family that is what this time of year is all about isn't it. What a beautiful baby! I hope that you had a great Christmas. I couldn't manage to reach you through the link on your profile so it has to be a public approach. I just came across your Curve of Pursuit - not and would love to use your picture and words on my web site. I try to include work inspired by our ideas - even when they didn't go according to plan. I am sure the members of the group would also love to see your picture and hear your story. You will also pick up inspiration from some very strange sources. Congrats on the new nephew! He's gorgeous! He's sooo cute!!! What a sweetie! Tell mommie she did a wonderful job and kisses from us all. Hmm.. the 1st of January has gone by and I'm a bit late in contacting you. Sorry! I'm a bad pal :( Belated good wishes for 2007! I'm still busily compiling a goodie box for you, even though I'm being more of a lurker here than an active commenter.